Natural Reserve of Illes Medes, L’Estartit, Spain. Snorkeler on water surface Medes Islands, Costa Brava, Spain. Stretching across the northeastern corner of Spain up to the French border is the famous Costa Brava shoreline: home to some of the best beaches in the Mediterranean. L’Estartit is the small seaside town just outside of Girona, which centers around its beach on the tip of the Bay of Roses. Platja de l’Estartit lies less than a mile from the seven islets of the Medes Islands archipelago, a protected marine reserve that offers a rich diversity of flora and fauna reserves. From the shores of l’Estartit, it’s easy to make your way over to the islands to observe everything from brightly colored coral, starfish, and gorgonia at shallow depths or explore the rocky caves and shipwrecks that remain conserved today. Aerial view of San Sebastián, Spain. 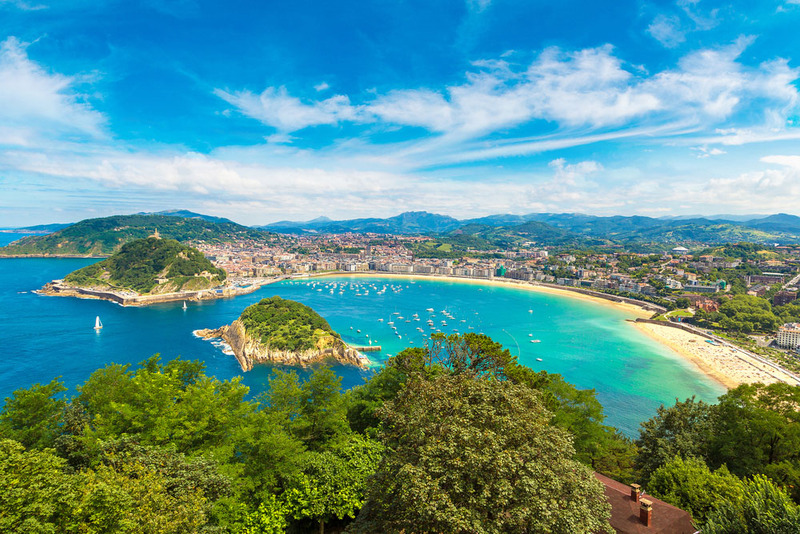 Named after the seashell shape of the The Concha Bay (literally shell), Playa de la Concha in San Sebastián is consistently rated as one of the best beaches in Europe. This sweet Spain beach is highly photographable, with spectacular views of Urgell Mountain on one side and Igueldo Mountain on the other. The beach stretches from the old harbor and city hall for 1,500 meters to what’s known as the Parrot’s Beak. The mountains protect the beach from strong winds and high waves, while the shallow and calm waters make this spot ideal for travelers of all ages. Elsewhere, you can find activities like paddling, sunbathing, and swimming, making it the perfect beach for everyone in the family. The Balearic Islands are home to some of the most beautiful beaches in Spain, so it’s no wonder why the biggest island of Mallorca has become one of Europe’s hottest destinations in recent years. Despite the hordes of tourists roaming Mallorca, Cala Llombards is a spot that hasn’t yet caught on. Located near the small village of Es Llombards, the secluded cove beach is tiny at just 55 meters in length and surrounded by pine trees and bushes. Once you’re there, however, it’s hard not to marvel at the dramatic rocky cliffs, steep drops, and deep waters – all the right ingredients for cliff jumping. Even if you’re not the thrill seeking type, Mallorca’s postcard scenery climb to the top of the cliff alone will leave you breathless. Honeymoon couple, Playa de la Venus, Marbella, Spain. Bright blue waters, Marbella, Spain. In Spain’s most southern province of Andalusia lies the beautiful Costa del Sol, which is comprised of dozens of seaside towns and former fishing settlements along the shores of Málaga. Marbella, in particular, is a little slice of heaven. With over 17 miles of beautiful coastline, Marbella has endless beaches (24 to be exact) that are within a short journey of luxurious resorts and hotels. Playa de la Venus is the centrally located beach of Marbella whose palm-tree lined promenade, white-washed Andalusian architecture, and warm-hearted locals make for a truly romantic getaway. Palm tree promenade, Playa de la Malvarrosa, Valencia. Many people come to Spain in search of great weather, pitchers of sangria, and daily siestas, but the delicious Mediterranean cuisine also makes it one of Europe’s top food destinations. If you’re just getting acclimated to Spanish food, Paella is one of the best Spanish dishes to try, and what better way to enjoy the rice-based platter than going back to where it originated — Valencia! Located in the heart of the city, Playa de la Malvarrosa is one of the best beaches in Spain for those who want to take an introduction course to Spanish cuisine. It’s a safe, clean, and popular destination among locals and visitors, but the real draw is the beach’s promenade that features an endless array of seaside restaurants and bars, each with their own take on the famous regional dish. Playa del Ingles, Gran Canaria, Spain. Beachside sand dunes on Gran Canaria, Spain. Playa del Inglés and the surrounding dunes of Maspalomas have been attracting millions of sun-chasing tourists since the resort was developed in the 1960s. Located on the southern coast of the island of Gran Canaria, Playa del Inglés is the most famous holiday destination (most notably the Northern European crowd) in the Canary Islands, and it’s not hard to see why, as the island receives roughly 320 days of sunshine and blue skies each year. Playa del Inglés is more than a beautiful Spain beach with great weather; it’s become one of Europe’s premiere clubbing destinations, where the party starts early in the day and continues well into the night. Big waves at Playa de Mundaka, Biscay, Spain. With a dream left hand barrel and arguably the best river mouth wave in the world, Playa de Mundaka has been celebrated as one of the world’s top destinations for surfing since the 1960s. One of the former sites of the World Championship Tour of Surfing, Playa de Mundaka is located on the rocky coast on the Bay of Biscay. While the town of Mundaka itself is a sleepy Medieval village, the architecture does make for some interesting views (the take-off point even overlooks an 11th century church). The hollow, fast barrelling waves of Mundaka rise to a height of 12 ft and make this scenic stretch of Basque coastline a must to check off for surfing enthusiasts of all levels. Hugging the coastline of La Barceloneta, Barcelona’s once thriving fisherman’s quarter, Playa de la Barceloneta, is one of the most-visited beaches in Spain. 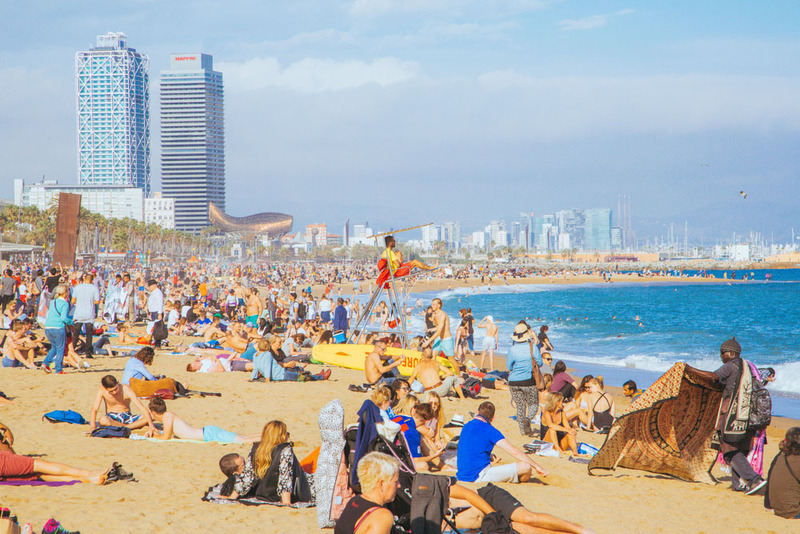 The beach features a lively atmosphere with activities ranging from volleyball to paddleboarding, while the area of Barceloneta itself is packed with joggers and cyclists as well as tapas bars, seaside patios, and surf shops as far as the eye can see. For the entire stretch of the beach, the famous W Hotel can be seen soaring for miles, whereas some of the biggest nightclubs in all of Barcelona can be found along the shores of the beach. Located in the historic city center, the beach is just a quick walk or short cab ride away from all the major tourist attractions, sites, and hotels in the city. Just off the shore of Galicia lies the powder-white sand and azure waters found across the Cíes Islands. While Spanish beaches typically have the feel of the Mediterranean Sea, the northwestern Galicia sits just north of Portugal on the shores of the Atlantic Ocean, making for a different experience completely. As the point of connection for the islands of Monteagudo and Faro, the tranquil Playa de Rodas beach is where locals come to spend lazy summer days under the sun surrounded by pine trees and idyllic scenery — the ideal setting for those whose idea of a beach vacation involves a great book. The beach has a string of seafood restaurants and bars nearby where, from sangria to tequila to beer, you can find the perfect reading companion of your choice. Seeker is on a mission to connect and inspire the world’s travelers. Sign up for early access to our community of travelers around the globe.